Let history come to life - just the way it should do. ?As the modern world exploded with rapid changes - in transportation, in communication, in manufacturing - people around the globe faced overwhelming new challenges. As Christians arrived for the first time in other countries, they realized that being a Christian was about living out the gospel in every culture. And they realized that great injustice was everywhere! So they met the challenges of modern life with new ways of communicating Christ's ancient gospel. From Niijima Jo and Pandita Ramabai to Dietrich Bonhoeffer and Janani Luwum, they set out to rescue God's global people and redeem them to new life in Christ. Extra features throughout this book look deeper into issues such as modern Bible translation, living the Golden Rule, new developments in missions, and big moments in modern Christianity. 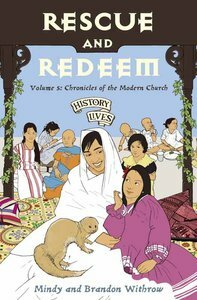 The fifth book in a series intended to cover the history of the Christian church through its people and key events. Written primarily for 9-14 year olds with a modern, relaxed and enthusiastic style. Many adults also enjoy these as a good read. This is history without the wooliness - and with all the wonder. About "Rescue and Redeem (#5 in History Lives Series)"
Mindy & Brandon Withrow are from Northwood Ohio and write and teach about history, theology and literature. Brandon and Mindy Withrow write and teach about history, theology and literature. They live in Northwood, Ohio.